Guitar wunderkind Joscho Stephan, a player who seems to know no technical boundaries, is at the forefront of the modern exponents of Gypsy Swing. Created in the musical swirl of 1930s Paris by the legendary guitarist Django Reindhart, Gypsy Swing was Europe’s first totally original contribution to the development of jazz. Its gloriously exhilarating style, combines driving straight-ahead rhythms with elegant melodic lines, serving as the basis for wild and virtuoso improvisations. 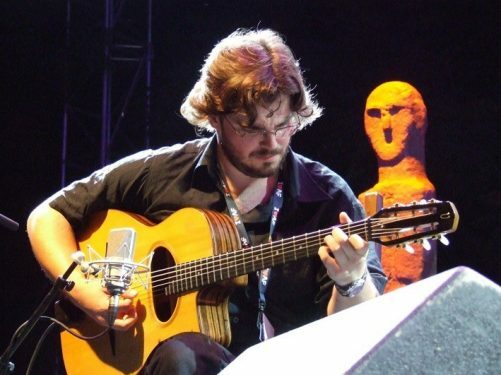 Stephan Joscho belongs to a new generation of guitar virtuosos who are introducing fresh stylistic elements into Gipsy Swing and his jaw-dropping technique has had audiences spellbound across the world. Come see for yourself.